Measuring 16" long and 10" wide and capable of catching the beer runoff from multiple faucets at the same time, Kegco's SECO-1610 Surface Mount Drip Tray makes an impressive addition to any bar! Constructed of polished stainless steel, it features a lift out louvered screen, welded corners for a smooth finish, and a cut out that can wrap around a 3" wide draft beer tower. 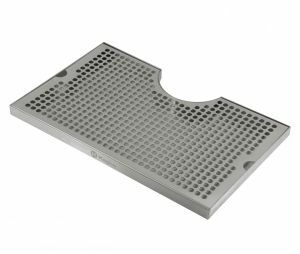 This drip tray does not include a drain but can be easily cleaned by simply carrying it to the sink to be rinsed. It is large enough to cover the recessed area on my popular kegerator models, making it easier than ever to upgrade from a plastic drip tray to a stylish stainless steel one for a whole new look.